MANISTEE — Having already lined up in opposite dugouts this season, Tuesday’s doubleheader between West Michigan D teams Manistee Catholic Central and Onekama was a non-league series. But, it played out much like the one that counted in the standings as the Portagers and Sabers split at Rietz Park. Onekama took the opener 5-3 in seven innings before MCC bounced back for an 8-3 win in the second game. The first game was tied at 1 through six before the Portagers exploded for four runs in the lone extra inning. Cordell Williams got the rally started with a one-out double to left that kicked off four straight hits. Jon Eno followed with an RBI single and Joe Eno and Stephen Verrett hit back-to-back run-scoring doubles before the Portagers plated their final run on an error. MCC had just wrapped up at least a share of the league title with a split against Brethren on Monday, which Ranville said was probably a factor. “After you get excited … it’s a natural downer to come back the next day after you’ve been so high the day before,” he said. MCC snuck a couple runs across in their half of the seventh on a sacrifice fly by Robert Sewell and a wild pitch, but they weren’t enough. Verrett earned the win on the mound with a complete-game performance that included four strikeouts. Sewell was charged with the loss after throwing six innings in relief of Nathan Papes and striking out five. MCC turned in a better offensive performance in the second game as it racked up nine hits against Onekama starter Nolan Miller, who went the distance while striking out four. 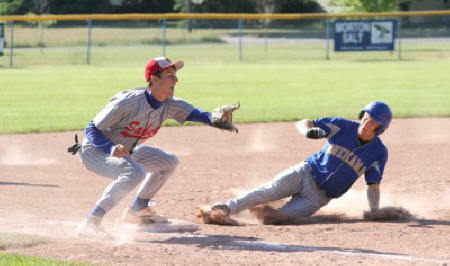 The Sabers took a 4-0 lead in the second inning and never looked back. Mason Clark led the charge with three hits and two RBIs, Sewell had a pair of singles and drove in two and Alex Bialik had two hits. Williams and Joe Eno both had RBI singles for the Portagers. Bialik got the win after allowing one unearned run on one hit with six strikeouts over his four-inning start that was limited because he ran out of outs after picking up a complete-game win the night before. Clark tossed two innings of relief and gave up two runs on two hits with two strikeouts.